When it comes to exercise, these are my natural inclinations – during that particular season, the corresponding activity just feels RIGHT. They’re not mutually exclusive – I’ll still go on walks in the fall, or to the gym in the summer, or hike in the spring – but by and large, the weather and the air dictate my workout, and this spring, I’ve found myself a 9-mile walking loop. I start at home, and head south through the Sunnyside and Highlands neighborhoods until I hit Lohi. Then, I cross the pedestrian bridge to downtown, and wind down Platte Street past REI. With the rollercoasters of Elitch Gardens off to my left, I walk underneath the Speer Bridge and past the Denver Aquarium, cross back over I-25, and through Jefferson Park. It’s a mile to Sloan’s Lake, which I circle, and then make the long trek north back to the house where I drink a gigantic glass of water. Last night, my friend and former co-worker Anna joined me on this walk. If you know Anna, you know that she is something special: kind and generous and authentic, an insanely hard worker, and uniquely talented. Also, if you know Anna, you know that she will probably be embarrassed that I wrote those things. Sorry, Anna. I would say you’re lame, but that would be a lie – and I’d rather go to heaven. Anyway, Anna has been in Denver since last September, and has done such an amazing job of embracing this current season of life. She, like many of us, finds herself in some unexpected circumstances – but has marched forward and done the things that feel right – for right now. Her current season is helping to determine the direction that she goes, and she is rolling through with such grace and aplomb. For a girl like me – often hell-bent on bulldozing my own path, come hell or high water, with nothing but The Future in mind – it’s so inspiring to see Anna live in the moment, enjoy the simple things, and take each day as it comes. 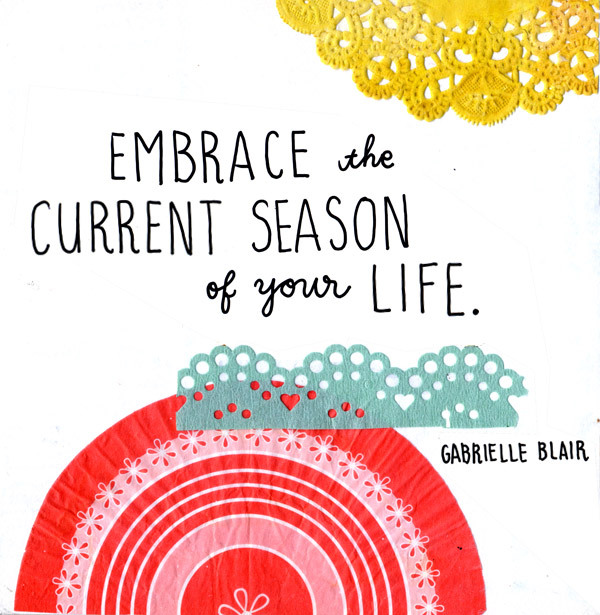 There are seasons to life, and adaptation is key. Like my exercise-of-choice, different seasons call for different routines, different practices, different processes. Little by little, and with friends like Anna, I’m learning to embrace my current season, shelving my expectations for the future, and experiencing the Now. Except I’m really excited that it’s almost hiking season. You understand. <3 <3 <3 <3 <3. Love you girls, the both of you, and wish so badly I could give you each a humongous hug right this minute.